Diego Simeone has welcomed the challenge of dealing with an increasing injury crisis at Atletico Madrid. Despite what many felt was a strong pre-season in the transfer market, the campaign has not started well for Atletico, who have won just one of three LaLiga matches and are already missing several first-team players. Santiago Arias (rib), Vitolo (knee), Nikola Kalinic (knock) and Stefan Savic (haematoma and suspended) are all absent from Atletico's squad list to face Eibar on Saturday, while Angel Correa (knee) and Juanfran (thigh) have been included despite recently recovering from issues of their own. Atleti's depleted numbers have forced Simeone to include two youth players in Andres Solano and Borja Garces, neither of whom have any competitive first-team experience. But Simeone has no grumbles over the situation. 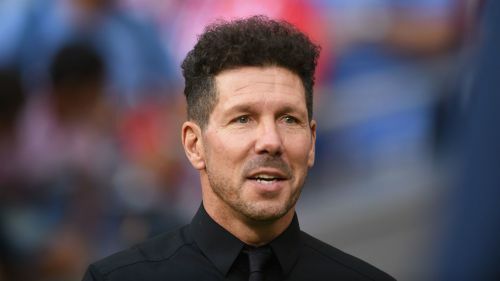 "It's clear that us here at the club, we accept the challenge and difficulties that we are faced with, those we have while short-staffed," Simeone told reporters on Friday. "But let's not forget that we have a lot going in our favour to be competitive in a competition that is very important, with large numbers in our squad and a lot of players that we have. "So, we know that ourselves. We accept that challenge and hopefully we can overcome that situation with the players such as Vitolo and Kalinic, who are not with us." Atletico's last match before the international break saw them lose 2-0 at Celta Vigo, with the performance drawing significant criticism. While Simeone acknowledges the fact he will not always be correct with his selections, he is confident that the quality they have in key areas should help decrease errors. "I take it [the criticism] well, I can be wrong," he said. "The criticisms appear because of the result. I accept the position that I have. "But there is high competition in this team. Rodrigo with Thomas [Partey], Gelson [Martins] with Correa, [Thomas] Lemar with Vitolo, and the central midfielders. I hope I make as few mistakes as possible."